Styling three ways is always a tough cookie because I am, unashamedly, a creature of habit and tend to inch slowly towards my black jeans every time, hoping that no one will notice. However, this H&M badboy turned out to be quite easy to do three ways because it's so versatile. Ha-lle-Lu-jah. It's nice and tailored which, being at the petitest end of the petite scale (a depressing admission), I always look for because I find it stops you looking like you're drowning under a mountain of material. Grey was a good colour for me too because it goes with everything, including my favourite 'colour', um, black. So, without further ado, here are the three looks (if you want to insert your own drumroll here you're very welcome to). For the first look, yes, ok, I went for jeans but it's the ONLY TIME, OK. I popped a faux fur collar on over the jacket, which I always find is an easy way to transform a jacket or coat/make it instantly warmer - and dug my good old thigh high boots out the wardrobe to finish the outfit off with because, let's face it, Autumn is well and truly here. The second look I'm trying hard not to title 'Fifty Shades of Grey' but the urge is there and it's very, very strong. I picked up this dress in H&M a few months back in both grey and black - if it ain't broke, buy it twice.. I think that's how that phrase goes, anyway - and although I'd normally wear it quite dressed up I thought I'd go for a more casual look this time, pairing it and the jacket with my favourite Senso glittery boots and a slouchy bag. The thigh high boots make a return for look number three but the jeans don't ('thank god! ', I hear you sigh). There's always a risk of looking a bit Pretty Woman-esque when pairing thigh highs with a leather mini, so I went to the entire opposite end of the scale on my top half with a prim and proper polo neck and, of course, the jacket layered over the top. So there we have it, three different looks, one jacket (and only one involving jeans - a cause for celebration if I ever heard one). Let me know which one's your favourite if there's a particular one that tickles your pickle, but try and do it out of earshot of the other outfits because I don't want them to get offended. If you're on the lookout for a new coat or jacket before Jack Frost hits I couldn't recommend H&M more; I've had a little preview of some of the A/W goodies coming in and there's some absolute bangers in there. Introducing the new outerwear collection from H&M. From weather-proof tailored coats to classic biker jackets, make sure your outerwear makes a style statement this AW15. Great looks, love the last one!! they all look fab but i love that fur collar! the colour is really nice. those thigh high boots are killer too. great looks, love the green fur! such an incredible accessory! Oh gosh, I love each and every style but that first one in particular...OH BOY! I need me some OTK boots & that jacket looks really expensive. Such fierce combos! SAME when i find an outfit i just stick with it days on end! All 3 looks are amazing (as they always are!) but look 3 is my fave. Love the pop of orange! 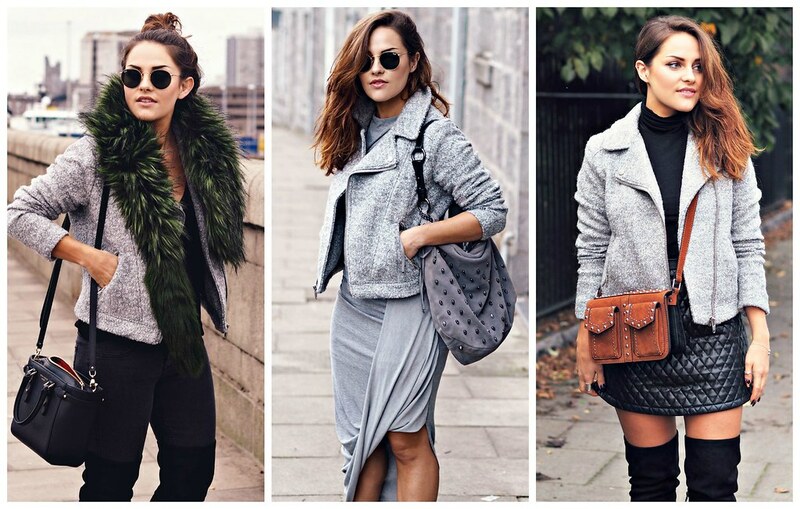 Oh my goodness: adore that grey jacket and how you've styled it! My fave would probably have to be the last one. That third look is killer, loving it on you! I love all three looks but I think the grey one is my fave! Love the green faux fur stole in the first look but the third one is definitely my favorite!! The first look is absolutely up my street! Love this! Love the jacket and I'm coveting every bit of the third outfit. That jacket is so nice, love the texture and the second outfit is a lovely light option for autumn! Love the jacket and how you styled all the outfits so perfectly! x Definitely want to purchase this jacket now! I think I'd have to fall in line with everyone else and admit that amazing green fur stole...well...stole the show. Absolutely no pun intended. Look 3 is the best! 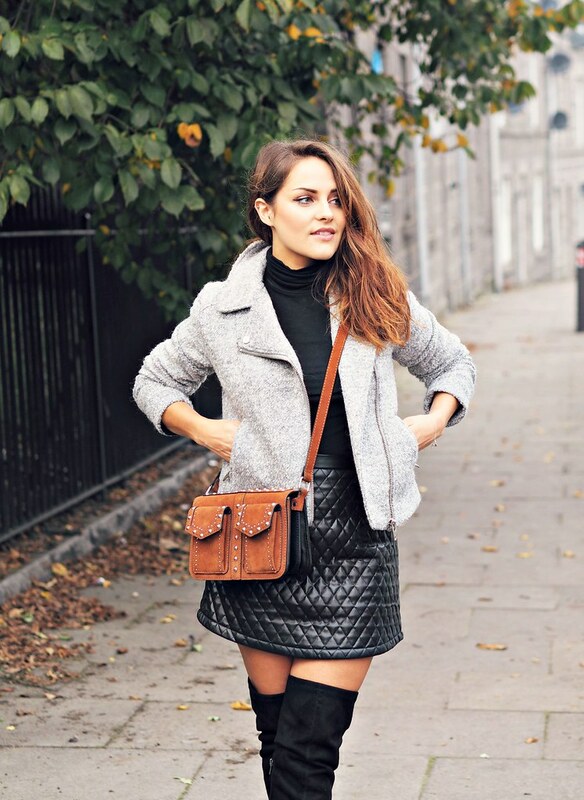 Great combo with the leather skirt!